Offered is a 79-card collection of baseball cards from 1954 to 1965 including a strong concentration of Hall of Famers. Includes: 1954 Red Heart Dog Food (1) - Snider (VG/EX); 1958 Topps (25) - Highlighted by: #190 Schoendienst (2: VG/EX, VG). 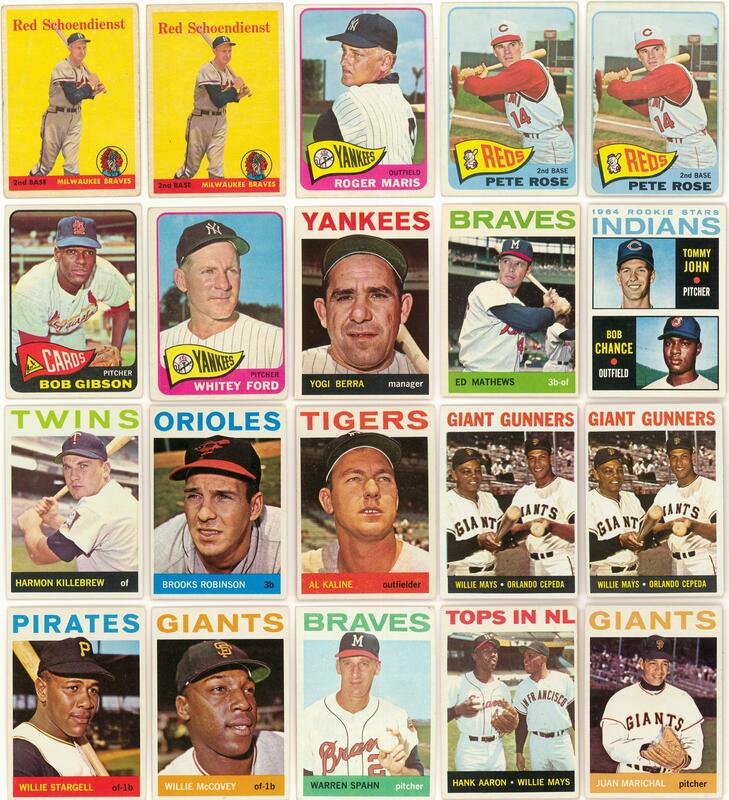 Mostly VG to VG/EX; 1964 Topps (40) - Highlights include: #'s 21 Berra (EX/MT), 35 Mathews (EX/MT), 146 John (EX/MT), 150 Mays (EX/MT), 177 Killebrew (EX/MT), 230 B. Robinson (NM), 250 Kaline (EX), 306 Mays/Cepeda (2: both EX/MT), 342 Stargell (EX), 350 McCovey (2: SGC EX-MT 6, EX/MT), 400 Spahn (2: SGC NM 7, EX/MT) and 423 Aaron/Mays (VG/EX). 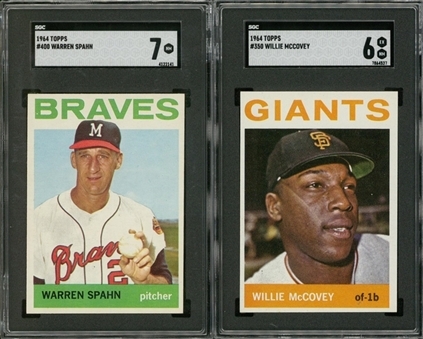 Median EX/MT; 1965 Topps (13) - Highlights include: #'s 155 Maris (EX), 160 Clemente (EX-), 207 Rose (2: EX, VG/EX), 250 Mays (VG/EX), 300 Koufax (EX), 320 Gibson (EX/MT) and 330 Ford (VG/EX). Aggregate EX.